The first finalist of the 2015 PBA Commissioner’s Cup was already booked its ticket. Rain or Shine completed a semis sweep of Meralco to advance to the best-of-7 championship series and await the winner between TNT and Purefoods Star. 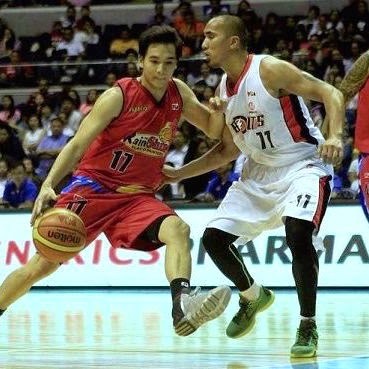 Chris Tiu helped ROS sweep Mike Cortez and the rest of the Meralco Bolts. Rain or Shine needed to weather a tough last stand from an import-less Meralco squad but became the first team to advance to the PBA Commissioner’s Cup finals after completing a three-game sweep with a 107-98 win on Tuesday at the SMART-Araneta Coliseum. Paul Lee led the way with 23 points, import Wayne Chism added 16 points, 11 rebounds, and 7 assists, while Raymond Almazan added 14 markers – 13 of those in the third quarter. The Elasto Painters won their best-of-five series, 3-0, against a Bolts squad that showed plenty of heart but just did not have the firepower to get it done as Josh Davis sat out with a dislocated shoulder. The game looked like it would get out of hand quickly. Ryan Arana and Lee combined to score all of the Elasto Painters’ points in a blistering 19-6 start. Gabe Norwood would later get into the act, knocking down back-to-back three-pointers that, combined with a free throw from Almazan, made it a 19-point game, 30-11, in the first period. Playing without an import, Meralco leaned on Mark Macapagal, who was red-hot in the second quarter, where he tallied 13 points. The Bolts rode that explosion from their back-up guard to take a lead of as high as five. Meralco led, 52-49, at the halftime break despite playing without Davis and with Gary David going scoreless in the first half. Almazan came alive in the third quarter, though, scoring 13 points as Rain or Shine opened up a double-digit lead. The Elasto Painters outscored the Bolts, 35-22, in the period. They led by as many as 14 points in the fourth quarter, breezing through to the title series. Cliff Hodge paced Meralco with a 20-point, 13-rebound effort, while Macapagal also finished with 20 markers. Big man Reynel Hugnatan recorded 19 points and 7 boards, while Sean Anthony and Mike Cortez tossed in 14 and 11 markers respectively. Line of the Game: Cliff Hodge (MER) - 20pts, 13rebs, 4asts, 1stl, 1blk, 7/13 FGs. Despite monster numbers, Cliff Hodge couldn't carry Meralco to the Game 3 win. 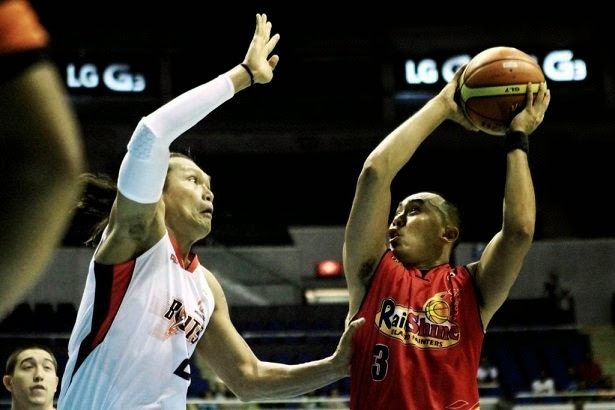 Paul Lee had another splendid showing for the Elasto-Painters. 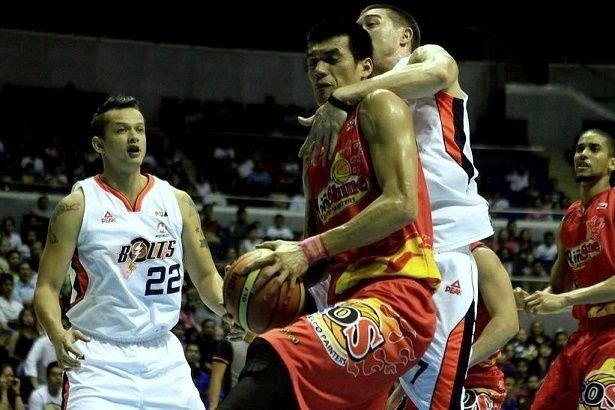 Raymond Almazan gets clobbered in the paint by Meralco's Cliff Hodge.